Famly run traditional house pub with cosy rooms full of music. 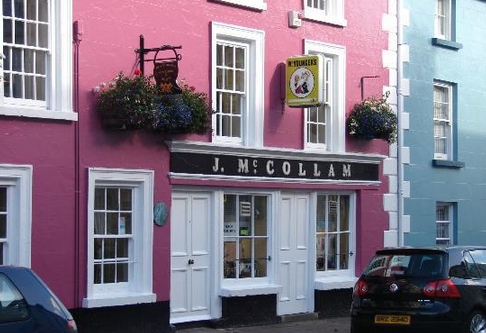 McCollams has been run by the same family since the mid 19th century. It is a destination pub for traditional musicians. On these premises, you will find no screens, radios or game tables. People are thrown together in intimate rooms with original turf fires that facilitate conversation, music, song, poetry, play reading, book launches etc. etc. The rooms exist soley as a back drop for devilment and craic of your creation. All the above is served, of course, with the best pint of Guinness in Ireland and the best irish whisky found anywhere in the world. A pub has alway stood on this site, The origins of the current building are in the Early 19th century. In the 19th century it was used as a public house and coaching inn. The notable arched entry in the Georgian facade gave access to a yard with stables. John’s niece Annie (Nancy) married Joseph McCollam of Armoy & the young couple came to live in Cushendall and took up ownership of the business. I am sure this young couple would not believe the pub would remain a working business in the same family linage five generations later in to the 21 century. Charabanc tours ran by McNeill’s of Larne lunched there on the popular coast road tour. The Glasgow & Paisley Fairs saw a very large number of Scottish people descend on Cushendall. So many in fact that the ‘hotel’ (Johnny Joe’s) had not enough capacity & guests were apportioned rooms in other houses in Mill Street, though fed in the pub. The building has remained largely unchanged. The bar has the original shelves and counters. The kitchen range was installed around the turn of the century, dated 1896, when the catering was almost exclusively done on it. As horse-drawn vehicles were replaced by mechanised ones the stable buildings were used to keep pigs and hens. The open fire in the bottling store was used to boil potatoes to feed the animals. The bottling store is now the back lounge.